This chapter will give a high-level introduction to a free automatic backup software for Windows 8/7/Vista/XP and Server 2003/2008/2012, named AOMEI Backupper. We will give a brief preview of its main features at first, and then, we also offer a detailed automatic backup demonstration over its Partition Backup. Automatic backup is the alias of schedule backup, it's an additional function which attached to Backup option. That is to say, automatic backup is the feature that allows you to set a schedule to back up system, disk or partition. After setting a backup time, the program will do backup at the given time automatically and regularly. Here, we can see that a free automatic backup software is an excellent assistant for people who are busy or forgetful. AOMEI Backupper is a free automatic backup software which allows user to do Backup, Restore, Clone and other similar tasks. Backup option not only provides automatic System Backup and Disk Backup, it also offers automatic Partition Backup, with the help of these functions you can choose to backup your entire disk with a full backup or you can also choose to simply backup the system and a specific partition. Apart from the common features of Backup and Restore, i have to mention you that, the Clone option play a similar role with Backup by making duplicate of disk or partition. It’s not sufficient for a powerful free automatic backup software to have these functions, therefore AOMEI Backupper provides a series of utilities to meet the expectation of users, such as check the data integrity of backup image, make a bootable rescue media and mount image to a virtual partition. Schedule backup steps for system, disk and partition backup are all the same, so we are going to give only one demonstration to Partition Backup (user can draw inferences about schedule backup). Step 1: Download and install AOMEI Backupper, run it and then find Partition Backup which located under the tab of Backup. Step 2: Click Partition Backup to switch to a new interface as below, select the partition that you wan to backup at Step 1, and choose a destination path for storage at Step 2, (you are supposed to choose an external hard drive, NAS, DVD, CD, etc. ) If you do this, you can restore your previous normal state even the whole system crash. Step 3: Here come to the most important step, setting a schedule for Partition Backup. Highlight the additional option of Schedule Off to enter into the Schedule Backup Settings. 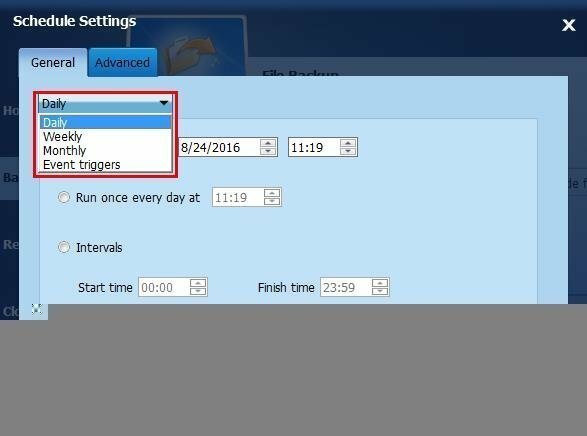 As you can see from the screenshot, there are four options available, Daily, Weekly, Monthly and Event Triggers. Read the notice carefully and then set an ideal backup schedule according to your needs, you could refer to this article for a clear explanation if you don’t understand anything. Step 4: If you get all this ready, then click OK and Start Backup to start. After that, the wizard will notice you with two options as follows. Step 5: You could choose to add the schedule you've created and start backup immediately or only add the schedule. Finally a new interface will remind you that the operation has been completed successfully. There are plenty of other functions that have not been listed in this article, such as Comments, Compression, Encryption, etc. I’m sure AOMEI Backupper is a fairly stable as well as user-friendly free automatic backup software. And I am confident that this software will embrace a bright future so long as we insist our constant supports.